What’s on your Great Lakes bucket list? “The glaciers made you, and now you’re mine” is a song lyric from a Canadian folk rock band called the Great Lakes Swimmers. The song – “Your Rocky Spine” – is a metaphoric love poem about the region. The words perfectly capture the affinity I now feel for Lake Michigan. A wilderness writing course brought me face to face with a Great Lake for the first time in my life last weekend. We camped at Nordhouse Dunes Wilderness Area in Manistee, Mich. Despite the cold, rainy weather, this native Texan had the time of her life. I hiked in the forested areas along the shore, took a nap in a huge pine tree and did some yoga on the beach. I reluctantly left Lake Michigan that weekend with a feeling of awe and respect for its beauty. The experience lifted my spirits – that’s why it was somewhat disheartening to see another set of Lake Michigan dunes on an endangered beaches list when I got home. The Yahoo Travel’s “Last-Chance Beaches” list featured seven beaches to see before they’re lost to rising sea levels, erosion and development. The list included the Maldives in the Indian Ocean, Mullins Bay in Barbados and Michigan’s Saugatuck Dunes –just two hours from the Nordhouse wilderness area. 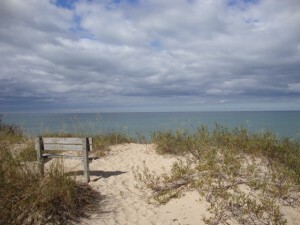 Saugatuck Dunes are also on National Trust for Historic Preservation endangered places list. That’s because a development, which includes 30 homes, a golf course, marina and hotels, threatens the ecology of the shore, according to the article. I’m definitely adding the Saugatuck Dunes to my travel bucket list –a checklist of places to see before it’s too late. But now I’m curious. Which Great Lakes places are on your bucket list and what makes them so great? ‘Glad to know you loved Nordhouse Dunes. It makes all those years of effort to protect Nordhouse as a Wilderness Area in the Michigan Wilderness Bill worth it, and it remains one of my favorite places in the Great Lakes. How sad that the very notion of destroying sand dunes is still considered “development” in 2010 (anywhere in the world) but especially along the Lake Michigan shore. Still on my list? The ancient petroglyphs along Lake Superior’s shores, the Huron Mountain Club, a return to the Benjamin islands in Georgian Bay, and many more returns to Pictured Rocks National Lakeshore on a perfect summer’s day.